Happy National Scrapbook Day 2018! Hello friends! Today marks almost 20 years of my being involved in scrapbooking, and while I can hardly believe that amount of time has passed, I'm so thankful I have albums (and albums and albums and albums!) of documented memories thanks to this amazing hobby. It has inspired my love of photography, words, and capturing moments that otherwise might be lost. And what better way to celebrate that love than with a page filled with hearts?? One of my favorite techniques for a page is filling a die-cut with lots of different papers and layering my photos on top. This heart cluster is perfect for Valentine's and love-themed layouts, and while this page is neither, it adds a girly, feminine touch to page about Riely's choir concert. It would also be perfect sized down to fit on a card! Taking cues from the colors in the photos, I selected several red, pink and white patterned papers to fill the heart shapes. Then I added in a happy plaid with those same colors and a pop of aqua. (Most of the supplies from this layout can be found in the SCT Delivered winter kit, Sleigh Bells). You might notice that most of these papers are from winter and Christmas-themed collections - which just goes to proves that you can use themed papers however you want! If the color and pattern work with my design and photos, I will incorporate it! I know all you scrapbookers are excited for this weekend as we celebrate our wonderful hobby! 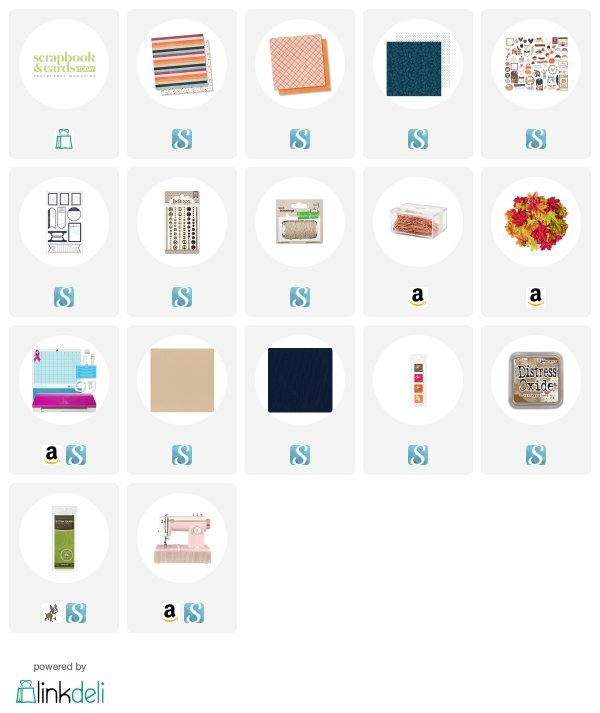 I'm excited to be joining in the fun with Scrapbook.com and wanted to share a project I created for the Live, Laugh, Layout Challenge. It's all about using embellishments creatively, and since these are one of my most favorite products, I was excited about designing a page focused around buttons, brads, ephemera, jewels and more! I started with a simple circle cut file (available in my etsy shop) that created the perfect focal point for my photos. (And yes, I might have been subconsciously inspired by my beloved Target logo!) I then added a variety of brads, chipboard, buttons, ephemera, sequins and jewels to look like they were floating amongst the rings of the circles. 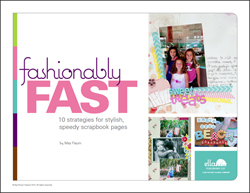 I love the fun energy all these pretty embellishments add to the page - it just makes me happy. It also makes me realize that sometimes too much of a good thing....is a good thing! So are you ready to pull out your stash and create a page? Then let's get going - here's the scoop! 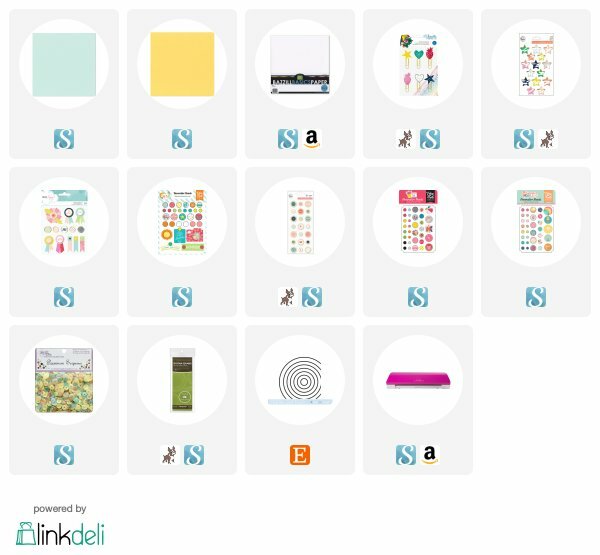 Create a layout that incorporates a wide variety of embellishments - washi tape, 3-dimensional elements, title stickers, ephemera, buttons, brads! 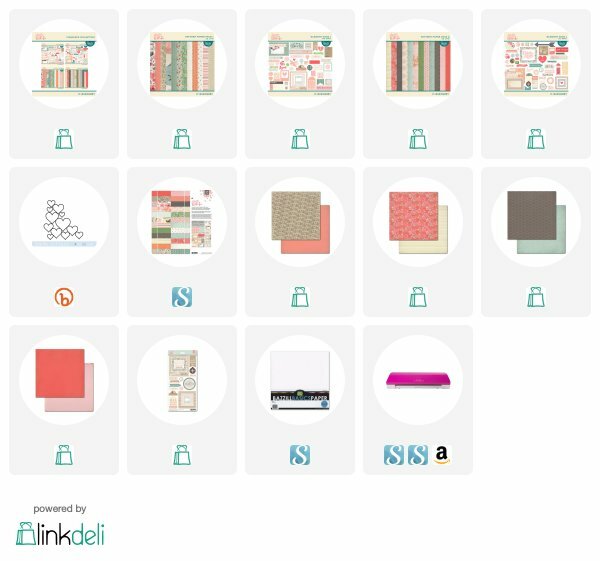 Scrapbook.com will select 10 winners that best incorporate a unique mix of embellishments within the project while also meeting the challenge requirements. All projects and skill levels will be considered. Projects that display a unique mix of embellishments usually demonstrate the ability to add a large quantity of embellishments or focus on using them in surprising ways to tell a story, evoke emotion or showcase a special skill (journaling, photography or artistic arrangement). 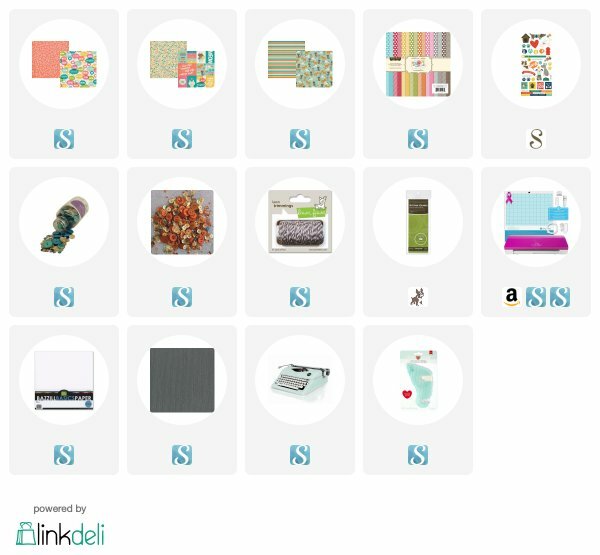 Upload and link your project featuring a unique use of embellishments for your chance to win! 1. Join the Live, Laugh, Layout Challenge. 2. 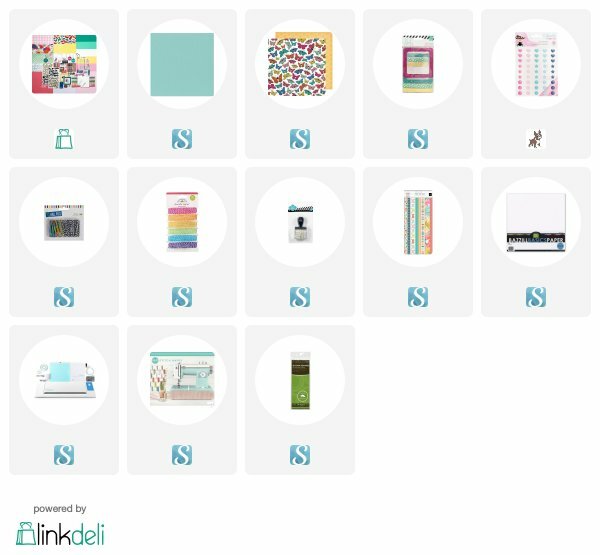 Create a new, never-before-published layout that showcases a wide variety of embellishments while also meeting the challenge requirements for your chance to win! 3. Upload your entry to the Scrapbook.com Gallery. Be sure to check the box at the bottom of the upload page to add your project to the NSD Live, Laugh, Layout Challenge. 4. 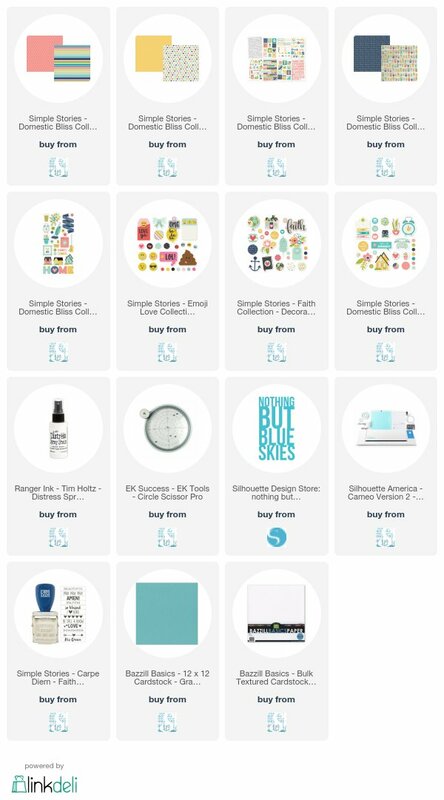 Link at least 3 products used in your layout. 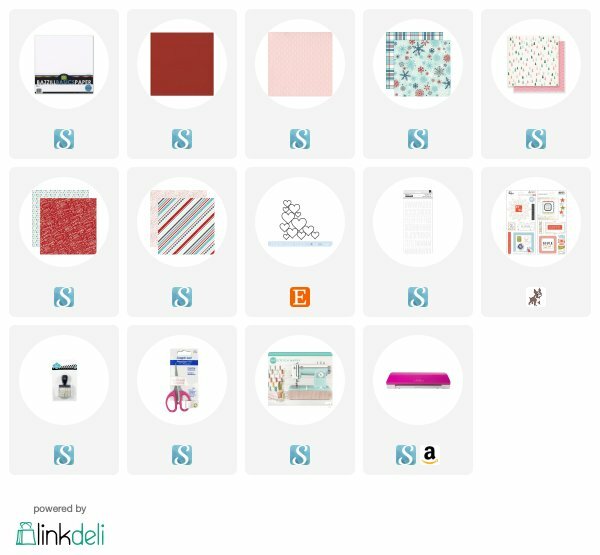 You are not limited to products you have purchased at Scrapbook.com. 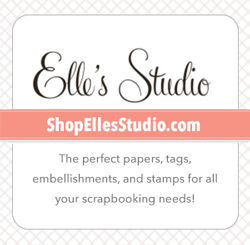 You may link embellishments, washi tape, adhesives, paper trimmers, ink, paint, stencils, punches, die cutting machines, glue and cardstock too! 5. There is no limit to the amount of times you can enter this challenge, but you are only eligible to win one prize per challenge. 6. 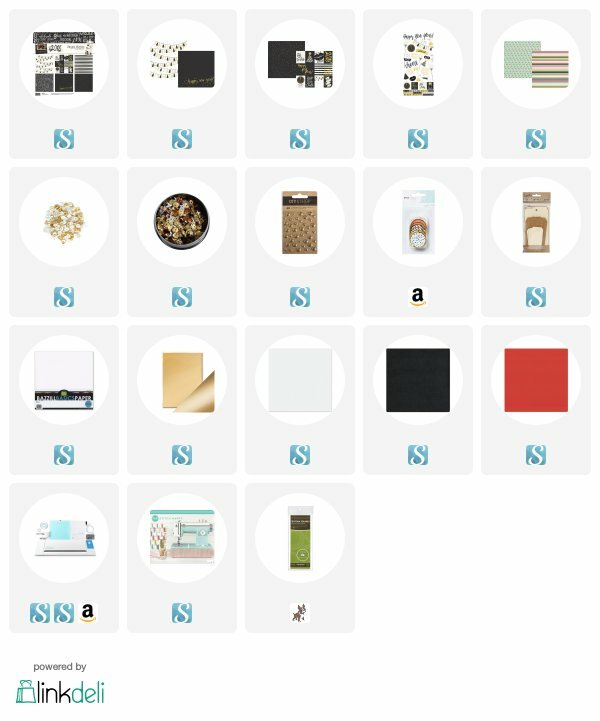 Winners will be announced on the Scrapbook.com Blog no later than May 31, 2018. Ten winners will each receive a surprise prize package valued at a $100.00 from one of our amazing sponsors. No two prizes packages are alike!You must redeem your prize within 60 days from the time the winners are announced or another winner will be chosen. 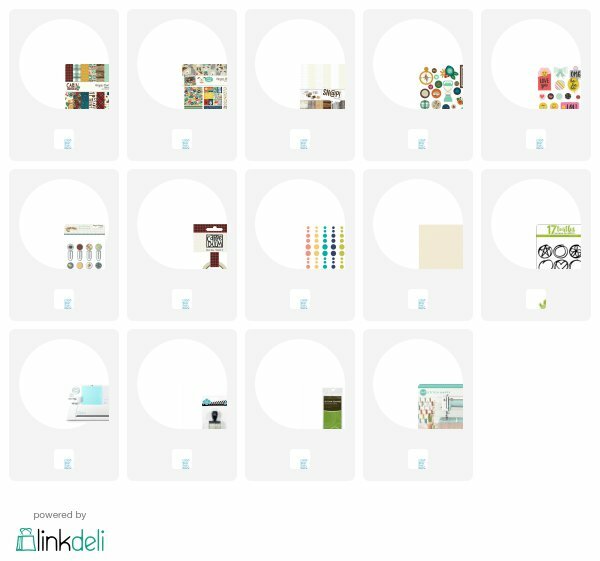 And be sure to stop by these participating blogs for more inspiration for the Live, Laugh, Layout Challenge. 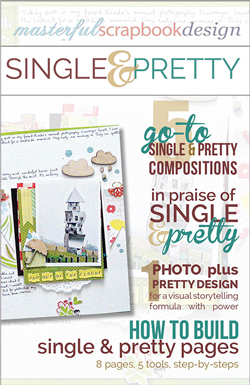 You'll find plenty of unique and creative projects and it's a great way to kick off the NSD celebration! I know spring is on its way (despite the fact that Mother Nature is teasing us with 70º temps one day and several inches of snow the next!) and that's because the newest SCT Delivered kits are now shipping! And there's no better way to bring in the fresh air of spring than with these colorful collections. So while it may be freezing outside for a few more months, at least your scrap table can be a sunny spot! This is one of the pages I created with the scrap kit, Blue Skies & Butterflies. It's a super simple four-square grid that I filled with three photos, leaving one space open for a fun grouping of tags and my title. The kits come with a printable pdf of assorted tags that coordinate with the contents, and I love being able to print out as many as I might want to use! The glitter foam title is also a kit exclusive and it adds such a festive element to my page. For a bit of added texture on the top half of my page, I used the kit cut files and cut lots of flowers out of white cardstock. Layered over the base cardstock and then stitched in place, they create an interesting background. If you haven't seen the full kit reveals yet, head over to Scrapbook & Cards and take a peek! In addition to the scrapbook kit, the card kit, Sunshine & Showers is also available and it's just as bright and happy! I'll be back soon to share my other kit projects - happy March! But one technique makes that easier - cut files! 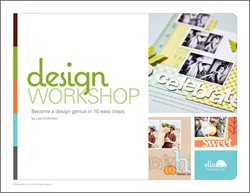 Specifically, cut files that provide a border and/or little spots to incorporate different colors and patterns. You can see lots of examples of this in my work (here, here and here!) and most recently, I used it with these Hand Drawn Circles from 17 Turtles. I ended up welding the various circles together to make a border before cutting it out of white cardstock. That left me 12 different areas to fill with a variety of papers (I used a mix of the Cabin Fever and Life is Ruff collections from Simple Stories). On the circles that contained shapes like the star, heart and flower, I took the opportunity to add a second layer of pattern! For added texture and dimension, I embellished the border piece with epoxy brads before adhering it with foam squares to the left side of my layout. Would you believe that there are EIGHT different patterns incorporated here?! 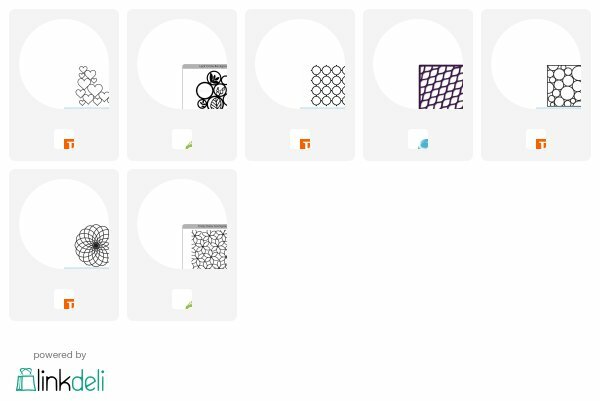 But the white border of the cut files keeps each pattern contained to a small area and clearly defines its space, so the patterns don't overwhelm the eye. To balance out the colorful border on the left, I added a small embellishment cluster in the white space on the upper right edge. A few stickers, a metal clip epoxy brad and a small strip of washi tape help add a mix of colors and textures to this area of the page. So the next time you're feeling overwhelmed with pattern options, try using them to fill a cut file collage! 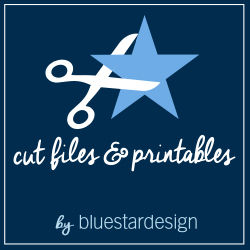 Some of my favorite cut files are below and they are guaranteed to make your next patterned project shine! We got our first official snow yesterday - a big dumping of big, fluffy flakes that coated everything in a soft blanket of white. It was beautiful, but didn't really stick to anything except the grass and trees, and most of it melted within a few hours. It was long enough to provide a cozy view from my office window (and stomp around in my rain boots for a bit!) but didn't require shoveling or make for yucky road conditions. In other words, my kind of snow. And since the rest of the week is forecasted to be back in the mid-60s, I think fall might stick around a bit longer. Can I get a big woohoo for that? To commemorate the snow I thought I'd post a winter themed two-pager today. It reminds me I still haven't bought our ski passes or checked to see what gear the kids have outgrown. Because that would mean I'm actually on top of things around here. Here's hoping I have a few more weeks to keep skipping those tasks on my to-do list! This layout features four 3x3 photos and one 4x6 with a big block of journaling in the middle. 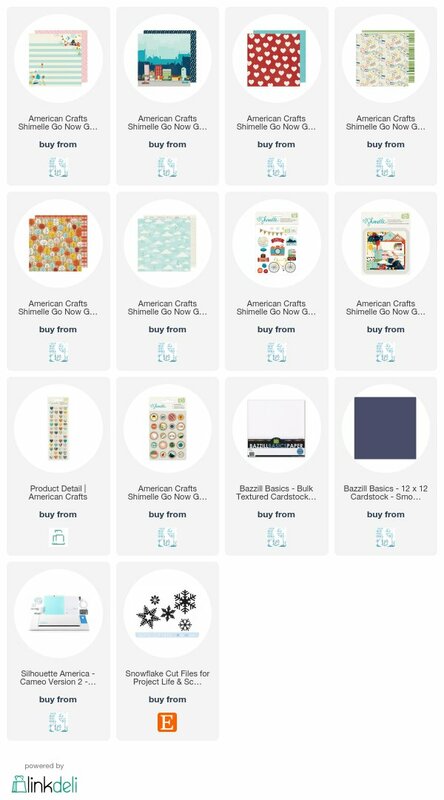 I had lots of fun adding many patterns into the mix (all from the older Shimelle Go Now Go line, but one of my favorite collections ever!) 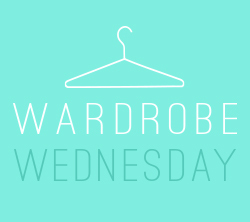 I've got plaid, polka dots, stripes, wavy lines and little cloud pattern thrown in too...but I think they all work! Behind my papers, I tucked in lots of the die cut ephemera pieces, creating three clusters that form a visual triangle on the page. There's also a few stickers and puff hearts thrown in for good measure. As summer tends to do, the days have been flying by and I'm wondering how the heck it's already mid-July?! Our summer bucket list is gradually getting completed, but I have a feeling these last few weeks will be jammed with activities as we try to pack it all in before school starts. Our house is still in disarray as we finish up our wood floor project, and we're living on portable camp chairs and take-out dinners, but it's been fun to see the transformation. Having everything cleared out of our first floor has me yearning for a clean, simple style and we'll definitely be doing some editing as we move things back in. I used lots of layered circles to give the page a good dose of color, all in the bright, happy hues. My circle cutter is one of my most-used tools (though you also use a Cameo to cut various sized circles like this!) To balance out all the curves, I opted for a linear title and a block of journaling that's right-justified. Continuing with the circle theme, I selected a few circular embellishments to scatter around the design. I tried to pick brads with colors and themes that related to the page topic. They add small pops of color and texture that help keep the eye moving through the whole layout. This is a page the comes together really quickly - the most time-consuming part is typing up the journaling and getting it positioned on the cardstock. And these days, quick is good - we've got a bucket list to tackle!